Your already very nervous about entering the gym jungle! Add into the mix your confusion about what machines to use and all of a sudden… it just feels a bit overwhelming! Well I don’t want you to feel this way and that’s why i’ve written this post. Once you feel confident in the gym and know what your doing you’ll never feel this way again. My aim is to educate you on the best machines to use, and boost your confidence so everything can then fall into place. Pass me the headache pills! There’s just too many machines…. With hundreds of funny looking machines around the gym it can be difficult to know what to do for the best! This machine does your arms, this one does your legs and this one… well I dunno what muscle that does! confused.com! Working your legs will not only improve their shape but also help you annihilate body fat from all over the body. The legs are our largest muscles, and trained properly burn a ton of calories! Complete 3 sets on the leg press machine, completing 15-20 reps per set. Rest 45s in-between sets. The seated leg curl machine works the hamstrings (muscles at the back of the legs!). Often our hamstrings are weak and under developed, because we don’t use them often, especially when sat down in our cars, or at our desks for long periods of the day. Weak hamstrings are also responsible for lower back pain. It’s essential we train them to not only burn fat, but also support our bodies foundation and prevent injury. Complete 3 sets on the seated leg curl machine, completing 12-15 reps per set. Rest 45s in-between sets. This machine works the muscles in the upper back, super important for posture and building an overall balanced looking body. Make-sure to include this exercise into your routine regularly. Try 3 sets, completing 12-15 reps per set. Rest 45s in-between sets. The chest (also known as the pecs!) is another very large muscle group which elicits a very high energy output (hello fat loss!). This exercise is straight forward to perform and packs one hell of a punch! Try 3 sets, completing 8-12 reps per set. Rest 45s in-between sets. Sculpted shoulders have the power to dramatically enhance the shape of your body, making your waist appear smaller. Try 3 sets, completing 8-12 reps per set. Rest 45s in-between sets. Pull ups are awesome because they are what’s classed as a compound movement (a movement which stimulates lots of different muscles). 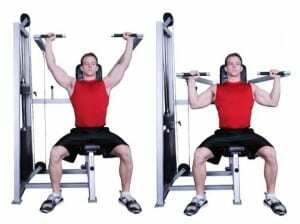 For example the wide grip pull up (as seen in the picture) works the muscles in the upper back and also the biceps. To complete a full pull requires lots of strength and for beginners it’s best to build up slowly. The assisted pull up machine allows anybody to perform the movement as it provides a platform which reduces your bodyweight – you can then slowly build up to full pull ups with practice. Try 3 sets, completing 6-10 reps per set. Rest 45s in-between sets. Zap fat from them Bingo Wings! This exercise targets the muscles at the back of the arm, the triceps (more commonly known as bingo wings!). 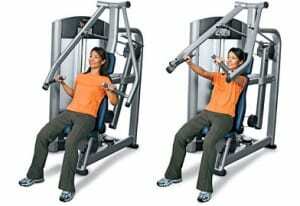 Use a cable machine and use either a straight bar (as seen in the picture) or a rope. Try 3 sets, completing 15-20 reps per set. Rest 45s in-between sets. My favourite out of all the cardio machines, because it’s low impact (knee friendly!) and encourages fat mobilisation from all over the body – due to the fact that your working multiple muscles (arms, and legs). The cross trainer will also improve your bodies circulation, which is essential for overall health and more evenly distributed fat loss. 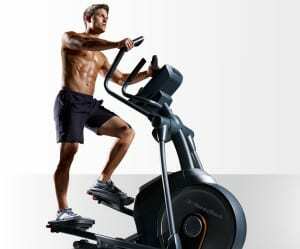 Try completing 20-30 minutes on the cross trainer 2-3x per week. The spin bike is low impact (more forgiving on joints!) and it’s a great machine for doing HIIT (High Intensity Interval Training) workouts. Try this workout… 10s cycling as fat as possible, followed by 50s slow recovery cycling, repeat this 10x, totalling 10 minutes. The rowing machine works the legs, back and arms. It’s a great machine to use for boosting overall cardiovascular fitness and improving muscular endurance. 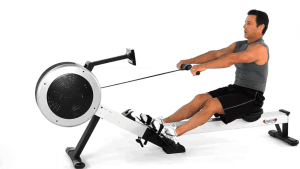 Try rowing 2,000m as fast as possible, then record your time and aim to beat it at your next workout.